Preliminary research shows the experimental patch can help repair damage caused by a heart attack. 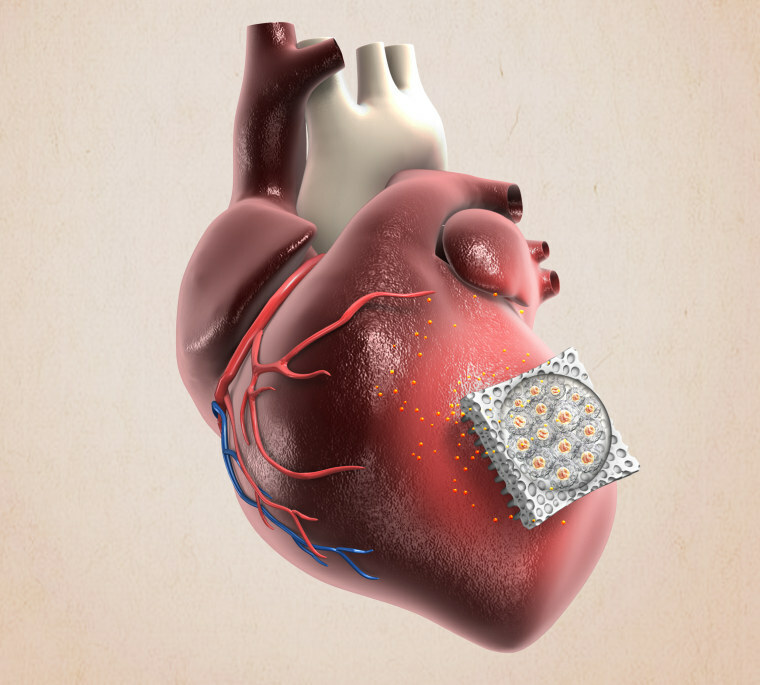 A spike-studded patch sounds a bit sadistic, but researchers say such a device could someday help doctors save the lives of people who have suffered a heart attack. The experimental patch — actually a plastic film filled with living heart cells and studded with microscopic needles — is surgically implanted directly onto the heart. Once in place, it delivers proteins and other health-promoting compounds released by the so-called cardiac stromal cells directly to the damaged muscle. The patch is at an early stage of development and hasn’t been tested in humans. But preliminary research on rats and pigs shows that it promotes healing of scarred cardiac tissue and helps boost the heart’s ability to pump blood. The cell-filled patch represents “an innovative approach [for] delivering therapeutic cells for heart regeneration,” the researchers wrote in a paper describing the research, published Nov. 28 in the journal Science Advances. If the patch can be developed for use in humans, a lot of people could benefit. Each year, more than 700,000 Americans suffer a heart attack. Some of those sufferers quickly succumb, while others go on to develop heart failure, a potentially deadly condition in which the heart’s pumping ability is dramatically reduced. Previous research has shown that injections of cardiac stromal cells can help protect and restore heart function in people who have had a heart attack. But getting the cells to linger inside a patient’s body and keeping them alive for an extended period of time has proven to be a difficult challenge. Hearts retain only a tiny fraction of cells that have been injected, according to one report published in 2014. Other experts have doubts about the patch, which in the case of the animal research involved a heart biopsy to obtain stromal cells and major surgery to affix the device to the heart. “The concept is incredibly innovative and novel — but the idea to put this into people is in question” because of the risks, said Dr. Douglas Mann, the cardiologist-in-chief at Missouri’s Barnes Jewish Hospital in St. Louis. For one thing, he said, such a patch might hinder the heart’s pumping motion. And he questioned the reliability of the animal tests. Cheng acknowledged the risks but said there might be ways to mitigate it. For example, he said, it might be possible to develop a patch that could be inserted via a catheter, eliminating the need for major surgery and the risk of complications and infections that it poses. WANT MORE STORIES ABOUT INNOVATION?